NOTE: RStudio v1.1.28 or greater is required to use RStudio project templates. If you’d like to test this feature, you can do so with the daily builds of RStudio distributed here. 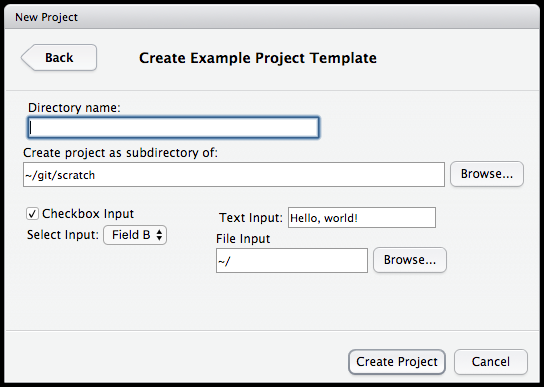 RStudio v1.1 comes with support for custom, user-defined project templates. Project templates can be used to create new projects with a pre-specified structure. R packages are the primary vehicle through which RStudio project templates are distributed. Package authors can provide a small bit of metadata describing the template functions available in their package – RStudio will discover these project templates on start up, and make them available in the New Project… dialog. and then accessing it from the New Project… wizard. Let’s dive in and see how exactly the ptexamples package defines and exports this project template. When this function is invoked by RStudio, it will receive the path as the path to the newly created project, as well as arguments as received from its input widgets. This function simply collects its inputs, and echos them to a file called INDEX in the newly-created project path. 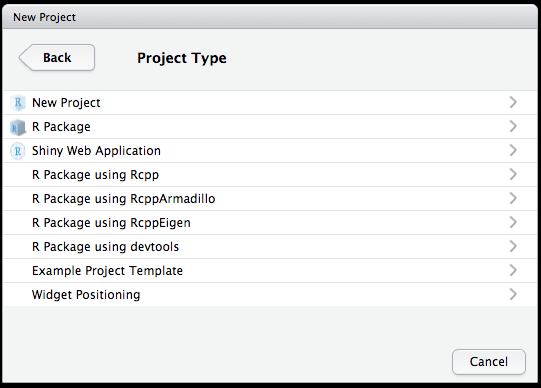 The Binding field tells RStudio which R function the project template is associated with. When a user creates a new project using this template, the hello_world() function defined by this package will be used to generate the project. The Title field is used and shown within the new project wizard. The OpenFiles field instructs the IDE to open a file called INDEX when the project is first opened, after creating the project. The following sets of fields are used to define input widgets – we’ll examine the first widget description in detail. The Parameter field is used to identify the parameter name. That is, the value of the widget used here will be associated with the parameter called check when passed to the template function hello_world(). The Widget field is used to specify the type of widget to be used. Here, we use a checkbox, to allow for ‘on / off’ input from the user. The Label field is used to give a label associated with the checkbox. The Default field gives the default value for the checkbox input – here, we want to default having the checkbox ‘on’, or checked. The Position field tells the RStudio IDE that this widget should be displayed on the left side of the wizard dialog. 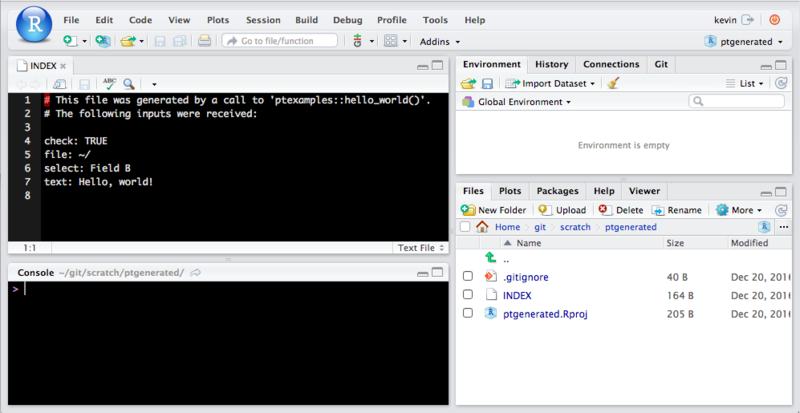 All together, this information tells RStudio that hello_world() is a function to be used in generating new projects, as well as what widgets should be used for arguments that the hello_world() can accept. Binding (required): The name of the R function to be called when this project template is invoked. Title (required): The title to be shown within the New Project… wizard. Subtitle: The subtitle to be shown within the New Project… wizard. This will be shown when the user hovers over the project name in the dialog. When unsupplied, this field will be generated based on the content of the Title field. Caption: The caption to be shown on the landing page for this template function. When unsupplied, this field will be generated based on the content of the Title field. Icon: The path to an icon, on disk, to be used in the dialog. Must be a .png file of size less than 64kb. OpenFiles: A comma-delimited set of values, indicating files that should be opened by RStudio when the project is generated. Shell-style globs can be used to indicate when multiple files matching some pattern should be opened – for example, OpenFiles: R/*.R would indicate that RStudio should open all .R files within the R folder of the generated project. The following widget types are accepted for the Widget field in widget descriptions. Represent a TRUE / FALSE input value using a checkbox. Select a single item out of a menu list of items. The Fields field should be a comma-separated list of fields to be included in the select input. Accept unrestricted text input from the user. Provide the path to a file on disk.